A wide coalition of Palestinian and international organisations denounced FIFA president Gianni Infantino’s failure to compel Israel’s national football league to exclude six football teams based in illegal Israeli settlements and called for the dissolution of the FIFA Monitoring Committee Israel-Palestine. FIFA’s failure to act against the Israeli settlement clubs renders it complicit in Israel’s violations of international law, and violates its own rules, which forbid member associations from playing in the territory of another member association without the latter’s permission. The FIFA Monitoring Committee Israel-Palestine, established in May 2015 and chaired by Tokyo Sexwale, was due to submit its report to the FIFA Council in October 2016. Israeli government officials have pressured the committee to soften its recommendations and prevent the exclusion of Israeli settlement clubs from its leagues. Despite promises of accountability, it seems that FIFA has bowed to Israeli pressure and is delaying the publication of its committee’s report indefinitely, therefore making more difficult action on the issue in the upcoming FIFA Congress in May 2017. The Palestinian Football Association, Palestinian and international campaigners, Human Rights Watch, lawmakers and the UN Special Adviser on Sport for Development and Peace Wilfried Lemke have long urged FIFA to ensure that football teams based in illegal Israeli settlements are excluded from Israeli football leagues. They have asked FIFA to suspend the Israeli Football Association (IFA) if it refuses to comply. Almost ten thousand football fans wrote to FIFA President Gianni Infantino last month demanding urgent action on Israeli settlements, but FIFA has failed to act. 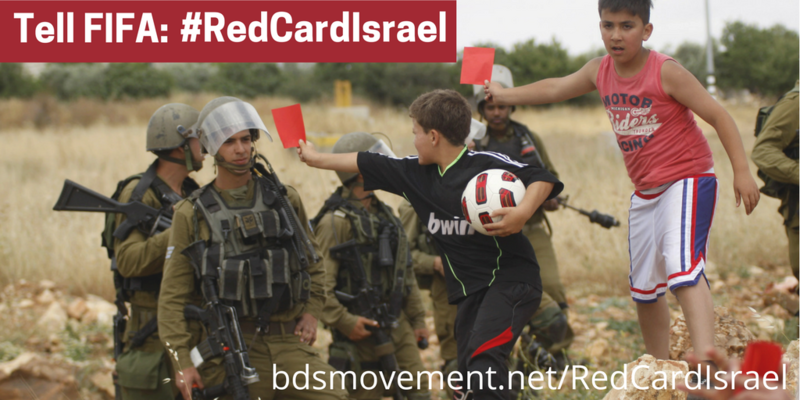 Dr. Geoffrey Lee, coordinator of Red Card Israeli Racism, said, “It's hard to see a logical reason for delaying the decision on Israel’s illegal settlements’ clubs and Israel’s persistent attacks against Palestinian football. FIFA statutes are crystal clear. This is yet another instance of Israel's political bullying tactics to deny Palestinian human rights." In April 2016, a report by John Ruggie, former UN Special Representative on Business and Human Rights, called on FIFA to do more to respect human rights. The recommendations led FIFA to enshrine a commitment to human rights in its statutes. The latest UN Security Council resolution 2334 reiterated the illegality of Israeli settlements, giving impetus to the efforts targeting settlement clubs in FIFA. Israeli settlements are not only unlawful under international humanitarian law, but they also contribute to serious human rights abuses. The settlement clubs play their home games on land unlawfully seized from Palestinians. Settlements are also a direct cause of harsh restrictions on Palestinians' freedom of movement, access to natural resources and ability to run businesses or build homes. International law considers settlements to be war crimes. The strategic document "FIFA 2.0: the Vision for the Future", published by FIFA in October 2016, promises that the organisation will be governed by the principles of transparency, accountability, inclusivity and cooperation.